For our latest mission, we installed a photography studio on a random subway car. We claimed that the MTA had hired us to take photos of every single person who rides the subway and that we’d be producing a yearbook at the end of the year. Most people were happy to pose for us, and the resulting photos show just how diverse New York subway riders can be. When are you publishing the yearbook? 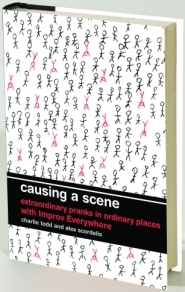 What you turned into a prank looks like an amazing opportunity. What do you plan to do the with the photos. Subways in India are one of the best places to hangout with friends. Its ambience make them people feel near to home or they are in their own home. I love subways and curious to go through this year book.